Gold: Higher Prices Short Term Or Buy Pullbacks? 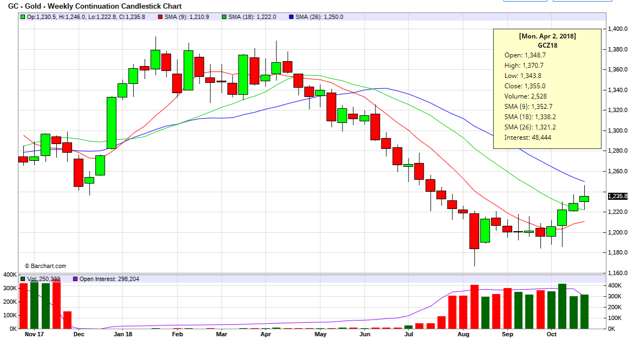 With gold closing around $1236, the market closing above the 9-day weekly moving average is confirmation that coming into this week we have a bullish trend momentum. If the gold market closes above $1235, the first target this week is the sell 1 (S1) level of $1247, and the second target is the sell 2 (S2) level at $1258. If the market comes down below $1235, it would negate this bullish trend to neutral and a second close below $1235 would activate the extreme below the mean of the buy 1 (B1) level of $1224 to the buy 2 (B2) level of $1211.. In this special weekend report, I want to review the gold and silver markets. Let’s see what the Variable Changing Price Momentum Indicator (VC PMI) is telling us for gold as we come into next week.